Replacing lost teeth is essential to a healthy mouth and a healthy body. It will provide you with increased aesthetics, of course, but will also improve your speech, ease of eating, and oral hygiene. Smiles by Beck is proud to have been restoring implants since their introduction to dentistry. Dr. Marci Beck, Dr. Glenn Beck, and Dr. Brian Beck have obtained advanced educational and clinical training in the restoration of dental implants. 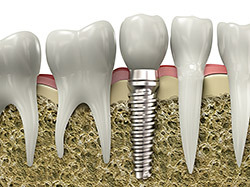 An implant is a synthetic tooth root in the shape of a post that is surgically placed into the jawbone. The implant “root” is usually made of titanium: the same material used in many replacement hips and knees, and a metal that is well-suited to integrating with human bone. After the implant is placed and integrated into the jaw bone, it can be restored with a crown to replace a missing tooth. Implants can also be used to replace multiple missing teeth (implant bridge) or to secure removable devices such as dentures. 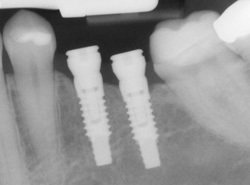 The advantage of replacing the root with a dental implant is that the bone in that area stays healthy and is not lost. Also, the instability of conventional bridges and dentures can make it difficult to eat or smile with confidence. Implants look more natural, have a stronger biting force, and feel like natural teeth. Dental implants are designed to last a lifetime, unlike bridges, which have an average lifespan of seven to ten years. Like your natural teeth, you dental implant needs the same preventive care and maintenance. You’ll still need to visit our Tallahassee dental office for twice-yearly checkups and cleanings with the Smiles by Beck team. Remember: the better you take care of your implants, the longer they will last! Feel free to visit our Tallahassee dental office to view before-and-after photos of completed implant restorations, and to find out if you’re a good candidate for dental implants.